Park Picnic Tables: Wood, Recycled Plastic, Concrete, Metal - Picnic Table Store-Commercial grade quality-lowest price. 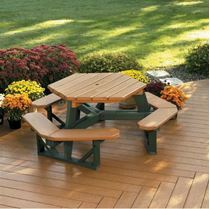 Picnic Table Supplier has the biggest selection of picnic tables perfect for your park. We have picnic tables for a local, national, or children's park! Below you will see our selection of picnic tables include many shapes and sizes. Call our friendly staff to help find the perfect picnic tables for your project. We can also find great companion products for your park such as grills and trash receptacles. RHINO Quick Ship Rectangular 6 Foot Thermoplastic Picnic Table, Portable, 218 lbs. RHINO Quick Ship Rectangular 8 Foot Thermoplastic Picnic Table, Portable, 264 lbs. 6 ft. Rectangular Wooden Picnic Table with Bolted 2 3/8" Galvanized Steel Frame, 198 lbs. Octagonal Thermoplastic Steel Picnic Table, Rolled Regal Style Seats 8 adults, In-ground Mount, 353 lbs. 8 ft. Rectangular Wooden Picnic Table with Bolted 2 3/8" Galvanized Steel Frame, 238 lbs. 6 ft. Rectangular Wooden Picnic Table with Welded 1 5/8" Galvanized or Powder Coated Steel Frame, 199 lbs. 8 ft. Rectangular Wooden Picnic Table with Welded 1 5/8" Galvanized or Powder Coated Steel Frame, 241 lbs. 12 ft. Rectangular Wooden Picnic Table with Welded 1 5/8" Galvanized Steel Frame, 362 lbs. 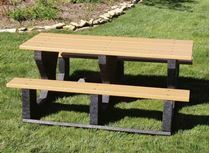 6 ft. Rectangular Wooden Picnic Table with Welded 2 3/8" Galvanized or Powder Coated Steel Frame, 229 lbs. 8 ft. Rectangular Wooden Picnic Table with Welded 2 3/8" Galvanized Steel Frame, 269 lbs. 12 ft. Rectangular Wooden Picnic Table with Welded 2 3/8" Galvanized Steel Frame, 407 lbs. 6 ft. Rectangular Aluminum Picnic Table with Galvanized Bolted 2 3/8" Frame, 133 lbs. 8 ft. Rectangular Aluminum Picnic Table with Bolted 2 3/8" Galvanized Steel Frame, 151 lbs. 6 ft. Rectangular Aluminum Picnic Table with Welded 1 5/8" Galvanized Steel Frame, 132 lbs. 8 ft. Rectangular Aluminum Picnic Table with Welded 1 5/8" Galvanized Steel Frame, 151 lbs. 12 ft. Rectangular Aluminum Picnic Table with Welded 1 5/8" Galvanized Steel Frame, 229 lbs. 6 ft. Rectangular Aluminum Picnic Table with Bolted 1 5/8" Galvanized Steel Frame, 108 lbs. 8 ft. Rectangular Aluminum Picnic Table with Bolted 1 5/8" Galvanized Steel Frame, 126 lbs. 8 ft. ADA Wheelchair Accessible Wood Picnic Table with Welded 2 3/8" Galvanized Steel Frame, 267 lbs. 8 ft. ADA Wheelchair Accessible Plastisol Picnic Table with Welded 2 3/8" Galvanized Steel Frame, 318 lbs. 8 ft. ADA Wheelchair Accessible Fiberglass Picnic Table with Welded 2 3/8" Galvanized Steel Frame, 285 lbs. 8 ft. ADA Wheelchair Accessible Aluminum Picnic Table with Welded 2 3/8" Galvanized Steel Frame,185 lbs. 8 ft. ADA Wheelchair Accessible Recycled Plastic Picnic Table with Welded 2 3/8" Galvanized or Powder Coated Steel Frame, 338 lbs. Hexagonal Recycled Plastic Picnic Table. Six sides to seat six for outdoor dining with attached Benches, 212 lbs. 6 ft. Rectangular Recycled Plastic Picnic Table, 'Walk Thru' Style With Three Legs, 475 lbs. 8 ft. Rectangular Recycled Plastic Picnic Table with Welded 2 3/8" Galvanized or Powder Coated Steel Frame, 328 lbs. 5 ft. Concrete Rectangular Picnic Table with Exposed Aggregate, 1000 lbs. 6 ft. Recycled Plastic Commercial Picnic Table, Rectangular, Seats 6, 259 lbs. 48" Single Post Square Recycled Plastic Picnic Tables with Galvanized or Powder Coated 6" In-Ground Pedestal, 435 lbs. 48" Single Post Square Aluminum Picnic Tables with Galvanized 6" Surface Mount Pedestal, 321 lbs. 48" Single Post Square Recycled Plastic Picnic Tables with Galvanized 6" Surface Mount Pedestal, 435 lbs. 48" Single Post Square Fiberglass Picnic Tables with Galvanized 6" Surface Mount Pedestal, 391 lbs. 48" Single Post Square Plastisol Picnic Tables with Galvanized 6" In-ground, 393 lbs. 48" Single Post Square Wooden Picnic Table with Galvanized or Powder Coated 6" In-Ground Mount Pedestal, 367 lbs. 48" Single Post Square Plastisol Picnic Tables with Galvanized or Powder Coated 6" Surface Mount, 393 lbs. 8 ft. ADA Wheelchair Accessible Wood Picnic Table with Welded 2 3/8" Galvanized Steel Frame, 263 lbs. 8 ft. ADA Wheelchair Accessible Wood Picnic Table with Welded 2 3/8" Galvanized Steel Frame, 270 lbs. 48" Square Wood Picnic Table with Powder Coated 1 5/8" Steel Frame, 224 lbs. 48" Square Wooden Picnic Table with Galvanized or Powder Coated 1 5/8" Steel Frame, 270 lbs. 4 ft. Children's Rectangular Plastisol Picnic Table with Powder Coated 1 5/8" Steel Frame, 140 lbs. Children's 48" Round Fiberglass Picnic Table with Powder Coated 1 5/8" Steel Frame, 169 lbs. 48" Round Fiberglass Picnic Table with 4 Attached Seats, 174 lbs. Square Thermoplastic Picnic Table, Infinity Style, Seats 2 Adults, 213 lbs. 6 ft. ADA Wheelchair Accessible Fiberglass Picnic Table with Welded 2 3/8" Galvanized or Powder Coated Steel Frame, 252 lbs. Multi-color Round Thermoplastic Steel Picnic Table, Regal Style, Seats 8 adults, 239 lbs. Round Thermoplastic Steel Picnic Table, Regal Style, Seats 8 adults, 239 lbs. 36" Round Picnic Table with Fiberglass Top and Plastisol Seats, 235 lbs. 6 ft. Children's Rectangular Plastisol Picnic Table with Galvanized 1 5/8" Steel Frame, 175 lbs. What kind of picnic tables are ideal for parks? In this selection you will find many vandal and weather resistant picnic tables. In-ground mounts can be installed into grassy areas making it great for parks. With an in-ground mount you don't have to worry about someone walking away with the park picnic tables. Thermoplastic and concrete are excellent for being exposed to the public and outdoors 24/7. Concrete is impervious to insects, rotting, and abuse from storms. Also consider having ADA compliant picnic tables available for group gatherings that may need a handicap accessible table. Many states require public parks to be ADA compliant.